California adopted a voluntary lighting standard tougher than Energy Star. Cree's 93-CRI replacement bulbs are the first to meet it. The California Energy Commission wants to make very sure that the state benefits from the energy savings LED lighting can offer. For this to happen, much of the lighting in the state needs to move to the new technology. One thing that could derail such movement is consumer backlash of the sort that retarded the market for compact fluorescents, after a flood of low-quality early entrants turned people off to the very idea of CFLs. A lot of the damage resulted from consumer disappointment with the poor color rendering of these cheap CFLs. LED lamps are not just more efficient than CFLs, they are capable of better color rendering as well. Those two qualities trade off, of course: higher CRI necessarily means fewer lumens per Watt. The CEC guidelines emphasize five quality attributes for LED lamps: color temperature, color rendering, dimmability, lifetime, and light distribution. In particular, they require a CCT of 2700K or 3000K and a minimum CRI of 90, with a minimum R9 value of 50. 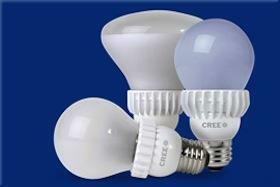 Cree has introduced two light bulbs that meet California's specs, called the TW Series (for TrueWhite). A 2700K, 93-CRI 60W equivalent consumes 13.5 Watts and produces 800 lumens, for 59.2 lm/W. (By contrast, Cree's original 60W replacement bulb gets 84 lm/W at a CRI of 80.) A 40W equivalent TW Series bulb produces 450 lumens from 9.5 Watts, for 52.9 lm/W. Both bulbs have an R9 rating of 70. With these lamps, Cree introduces a technique called "spectral notch filtering," which is described in this patent. I don't claim to understand how it works, but according to Cree it raises the CRI of LED-produced light. In the photos of unlit TW Series bulbs on Cree's site and in this review from ExtremeTech.com, the bulbs have a blueish tinge, quite unlike the plain white appearance of Cree's original bulbs. The blue color is caused by neodymium oxide in the bulb's glass envelope; it is this rare earth that is responsible for the spectral notch effect. The new LED bulbs will be offered exclusively through Home Depot. The 40W replacement costs $17.97, and the 60W replacement, $19.97. There are no products like them on the market now. Given the very competitive nature of the replacement bulb space, I have to believe the other big players will offer competing products soon. In theory, the TW Series bulbs are available for purchase now through Home Depot's site, via links found on this page. In practice, I found that the links took me to a generic page at Home Depot, and various searches there for the Cree products came up empty. This is something Cree is going to have to fix in a hurry. Cree's press release declares that the Sacramento Municipal Utility District will be announcing a rebate on the TW Series bulbs for customers in their service area. Other California power companies will likely do so as well. ExtremeTech.com speculates the rebate could be significant: "Cree's $20 high performance bulb could very well be selling for less than Cree's $13, 80 CRI bulb in the Golden State some time this year." If anyone can figure out how Cree's spectral notch filtering works from reading the patent, I'm sure many of us would like to hear about it.